Making Shakespeare relevant for contemporary society is often the work of theatre directors, scholars and teachers. But this is what the comedian Ben Elton has tried to achieve in his BBC comedy Upstart Crow, the third series of which is soon to begin. The sitcom sees the playwright trying to make it in London's theatre industry, while struggling with commuting back and forth to his family in Stratford-upon-Avon. This premise appears to be a lighthearted experiment of little value to a Shakespeare scholar such as myself. But the show does in fact raise some interesting questions that are relevant to anyone interested in the playwright and his world. Often my work as a teacher of Shakespeare involves persuading students to leave the cultural baggage at the seminar door. Some students arrive infused with the myth of the playwright divinely inspired, writing virtuoso works in isolation. They can be convinced that the plays are such perfected gems of genius that there is nothing more to do to but sit back and wonder in awe. Such ideas are inaccurate and also discourage engagement with Shakespeare: many people, students and audience members, feel too inhibited to explore and question his plays. In my research I attempt to locate Shakespeare in the vibrant theatre industry of the 17th century, reflecting upon the society in which he lived and worked. Where there is genius in Shakespeare, it is in his ability to draw on the rich materials that surrounded him and to weave these materials into dynamic literary works. I am also interested in what these plays say to us now – what stories are being valued and retold when the plays are performed. For me, Upstart Crow is involved in the same project as many Shakespearean teachers and researchers, albeit with very different effects. In Elton's sitcom we see the very fallible Shakespeare living in London's theatrical community, socialising with fellow playwrights (Christopher Marlowe and Robert Greene) and actors (Richard Burbage, Henry Condell and Will Kempe). Viewers also observe his home life and family relations with his long-suffering wife, children and parents. Each episode is based around the creation of a play; the plot derived from Shakespeare's interactions with his work and home community. Of course, there is much artistic and comic licence here: Taming of the Shrew is inspired by his grumpy daughter, Susanna, and the plot of Twelfth Night comes from a trick the dastardly Robert Greene tries to play on Shakespeare to embarrass him in front of his patron, the Earl of Southampton. In fact, both of these plays, as with many others, were based on existing source material. Unsurprisingly, the sitcom is not historically accurate. Much of the comedy derives from a playful dramatic irony about Shakespeare's future reputation, a knowingness about what is to come. In one running joke, Shakespeare keeps making up new words and promoting his contribution to the English language. We suspect, though, that Shakespeare's reputation for neologisms has been overstated – as has been explored by Emma Smith and Laurie Maguire – and, in Upstart Crow, other characters are quick to make fun of him: "You can't claim to have invented the whole of the English language!" There is also lots of humour in ironic similarities between Elizabethan and contemporary society, or characters speculating about England's future. In every episode Shakespeare travels from London to Stratford-upon-Avon and delivers observations about the frustrations of travelling, with sharp comic modern parallels between early modern and modern commuting. Without ever directly referencing modern political issues – Donald Trump, Brexit, Islamophobia – we are invited to laugh at our inherent belief in our modern sophistication and sense of historic progress. Sometimes this playful anachronism is too heavy handed – for example, Kempe's parody of Ricky Gervais begins to grate. 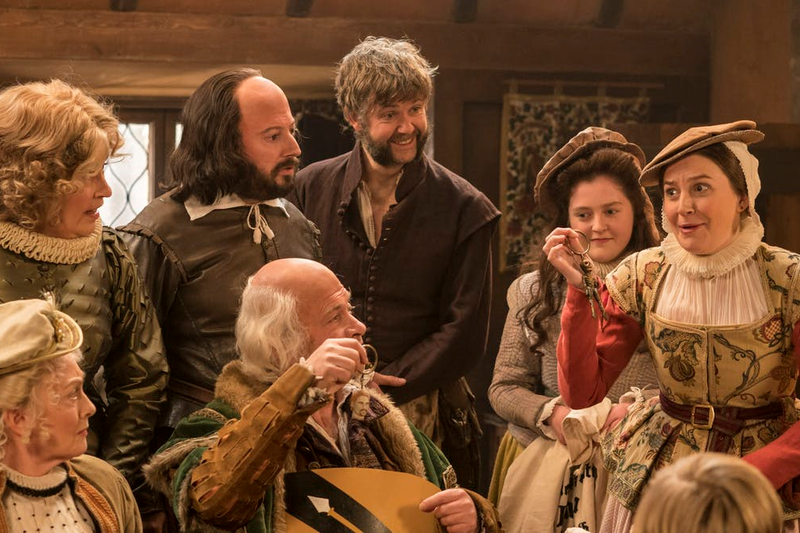 Upstart Crow follows a very familiar British sitcom formula, one honed by Elton in previous comedies such as Blackadder. We have a central character, with a bit of an ego, who finds himself thwarted by his circumstances, particularly by the forces of the British class system. In Elton's comedy, country boy and lowly-born Shakespeare is often reminded of his status by social superior and university-educated rivals, Marlowe and Greene. Shakespeare's ego is kept in check by Kate, the daughter of his London landlord, and by his wife Anne. Much of the comedy is driven by the female characters, who highlight the ludicrous sexism of the early modern period and expose Shakespeare's part in it. Far from beyond reproach genius, Elton's Shakespeare is a flawed anti-hero. Some might find this representation too disrespectful, but Shakespeare can survive a little chipping away at his 400-year reputation. And that chipping away is sometimes necessary. It creates a gap in which we might approach these plays without inhibitions and preconceptions, and see one of their biggest potentials. The playful anachronism of Upstart Crow shows us, as does the Globe's recent Shakespeare and Race Festival or productions such Liverpool Everyman's Othello, with its female lead, that the plays can provide a dynamic site for examining the concerns of contemporary society.